Logitech has debuted a new bluetooth mouse and keyboard designed to give us control over every single device in our lives. The K380 Bluetooth Keyboard and M535 Bluetooth Mouse can be used in tandem or separately and are made in such a way that they will work just as well with a Mac or PC as with a smartphone or tablet. 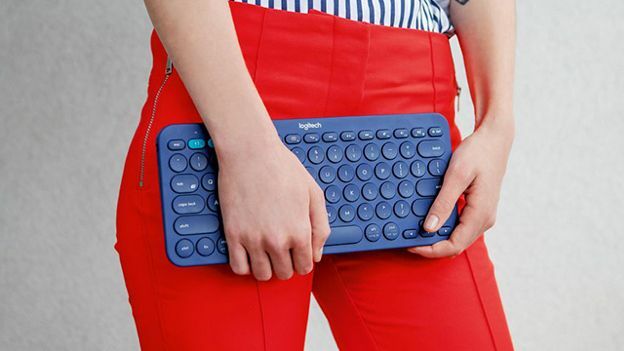 Logitech's K380 keyboard has the ability to connect to three Bluetooth devices at any one time and owners can chop and change between them by using the Easy-Switch setting. It has the intelligence to recognise which connected device it is working with and then map the keys to supported functions and shortcuts accordingly. Battery-life comes in at a whopping two years using just a pair of AAA batteries (they're even included! ), the keyboard is available in grey and blue colour-ways, and has an October release date at €44.99 (£32.90). The M535 Bluetooth Mouse is the ideal companion to the keyboard and includes a programmable navigational button that can be mapped for any task on any device. It handles everything from switching between desktops in Windows 10 to dragging-and-dropping files and using the Mac's three finger swipe gesture. It is versatile enough to be used on just about any surface and the device's curved shape includes a tilt wheel and one AA battery is enough for it to last for 10 months. You can get your hands on the new peripheral later this month in grey or blue and it costs just €44.99 (£32.90). Can Windows 8 work on the Sony VAIO Duo 11 tablet hybrid?